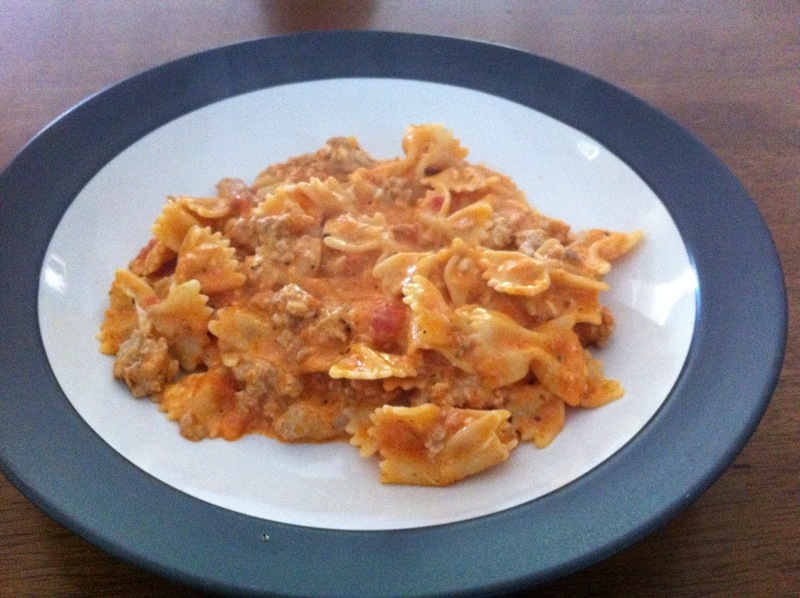 Last night I tried a recipe that I’ve been wanting to test out for a while… the Pioneer Woman Bowtie Lasagna. I hadn’t heard of the Pioneer Woman before, but apparently she’s a real thing. She claims this is a 16 minute meal – I would argue that it cooks pretty fast, but not that fast. I used the one pot method though – cooked the pasta then as it drained browned the meat. I suppose if I would have done both at the same time it would have been faster, but I chose less dishes over an extra 5 minutes. Also, I used ground turkey instead of ground beef… I’m finding that in sauces I can’t really taste the difference and it’s a little bit healthier. The website I found this on (Katie Cooks Dinner) recommended using Rao’s Homemade Pasta Sauce. It’s a bit pricey ($8.99 a jar), but was amazing. The next best thing to homemade! Apologies for the crummy picture. I was starving so I grabbed my cell phone instead of my camera. Boil pasta in large pot of salted water until al dente, drain. In large skillet, brown and crumble ground chuck until fully cooked, drain fat and return to pan. Pour cooked pasta on top of meat, then drizzle on olive oil. Pour on jar of sauce, salt, garlic powder and Italian seasonings. Stir. Add cheese and sour cream. Stir over low heat until cheese is melted and all ingredients are combined. Taste and add salt and pepper, if necessary. Serve with Parmesan or additional mozzarella, if desired. Seriously, it’s that easy. Enjoy!